As one can see, this trading company either used stand-alone marks on otherwise unmarked items or applied ⇒cover-up marks to obscure original manufacturer marks. In both cases the items themselves are otherwise untouched, which clearly sinks the often mentioned 'decoration studio' theory. 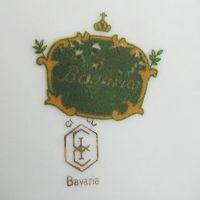 Manufacturer-marked porcelain items were provided by C. Schumann (Arzberg, Bavaria) and Heinrich & Co. (Selb, Bavaria), whilst the (otherwise unmarked) non-porcelain goods were provided by the manufacturers Schramberg or Schmider. 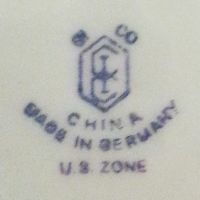 Marks with the 'US Zone' addition were used between 1946 and 1949, all other marks were used between 1949 and 1955. 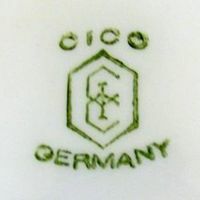 'CICO' on top of the logo above 'GERMANY'. 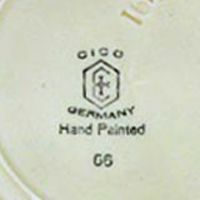 'CICO' on top of the logo above 'GERMANY' and 'HAND PAINTED'. 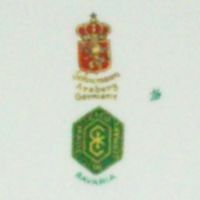 'CICO' on top of the logo above 'BAVARIA' and 'GERMANY'. Same as before, with 'U.S. ZONE' addition. 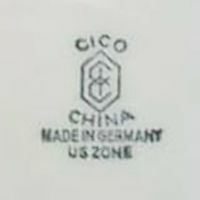 'CICO CHINA' above 'MADE IN GERMANY' and 'U.S. ZONE' addition. 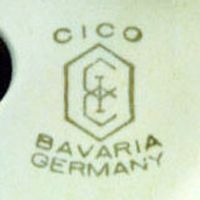 'CICO' above 'BAVARIA' only, but accompanied by a weird cover-up mark. 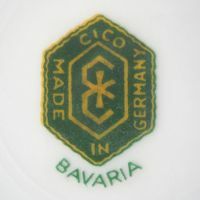 'CICO MADE IN GERMANY' above 'BAVARIA' addition, used as cover-up. 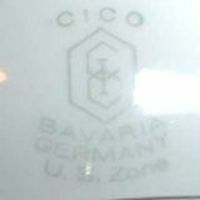 'CICO MADE IN GERMANY' above 'BAVARIA' addition, here with Heinrich & Co. mark shining through. 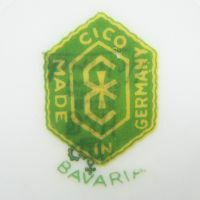 'CICO MADE IN GERMANY' above 'BAVARIA' addition, not covering a Schumann mark.